Fountain Hills Living in Fountain Hills: Real Estate, Education, Utilities, Amenities and More! Only 20 miles from downtown Phoenix and right next to the art-centric Scottsdale, Fountain Hills is Phoenix’s best kept secret. Surrounded by pristine parks and Indian preserves, this charming town offers residents purposefully-designed homes to take in the vistas of the snow-topped Four Peaks, Arizona’s endless sunshine, and star-filled night skies. Named after its famous fountain at Fountain Park ~ a popular gathering place for dog-walkers, joggers, family picnics, festivals, concerts, and holiday celebrations, Fountain Hills offers an active lifestyle filled with cultural and recreational events in an inviting and naturally-picturesque setting. Whether you choose to enjoy your afternoons being physically active in the great outdoors, or prefer to peruse the air conditioned museums, neighborhood shops, and art galleries on sultry days, Fountain Hills offers its residents so many options that you’ll find there’s little need to venture elsewhere. And, even once the sun has set, Fountain Hills remains vibrant with everything from fine dining, theatre, and dancing to everyone’s favorite nightly activity ~ star gazing. Although it’s no longer the tallest fountain in the world, this one-of-the-top-five tallest fountains is an event in and of itself. You can picnic, walk, or simply relax in awe of the Fountain. In order to ensure nearby homes and vehicles aren’t sprayed by the Fountain’s water, it’s not in operation when it’s too windy. Fountain Hills offers family movie night under the stars at the Fountain Park Amphitheater! The event is always free and movie-goers are encouraged to bring blankets or chairs. Refreshments are sold at the event, so there’s no need to haul a cooler. The LEGO Movie is scheduled for September’s viewing. Since Arizona is the golf mecca of the United States, it’s no surprise Fountain Hills has a handful of challenging and beautiful private and public golf courses for its residents and visitors. The Desert Canyon Golf Club, the SunRidge Canyon Golf Club, and Eagle Mountain Golf Club are all public courses just a couple of miles from the center of town. The FireRock Country Club and the Ancala Country Club are private-equity, 18-hole courses also in Fountain Hills. Whether your dream home in Arizona is one with mountain views, a golf course for a front yard, an estate with a private pool, or a multi-residential setting offering amenities provided by a property management company, Fountain Hills has real estate options for everyone’s taste ~ including upscale homes in gated areas, townhouses, single family residences, and apartment living. 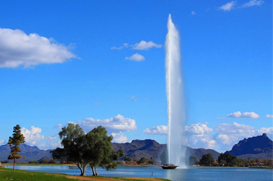 While all the restaurants and shops around town are enjoyable, truly the best thing about living in Fountain Hills is all the outdoor community events the town plans for its residents and area visitors. Every November at the Avenue of the Fountains in Fountain Hills, all vehicular traffic is closed for three days so that the popular thoroughfare can be transformed into the annual fall festival ~ one of the most popular and largest arts & crafts festivals in the Southwest. With 500 booths featuring the talent of artists from all over the world, this Chamber of Commerce-sponsored event offers everything from hand-crafted clothing, paintings, pottery pieces, sculptures, and unique knick-knacks, to lots of food from the local eateries and live music. You don’t have to be German to enjoy this annual fall event. Held in Fountain Park, you can expect non-stop music, Brats & Sauerkraut, a beer garden, kids’ rides, raffles, and lots of contests, including the event’s traditional Bier stein holding contests, Polka contest, Alphorn blowing, and the best dressed in traditional Oktoberfest German attire! 100% of the proceeds go to local charities. There are over 35 community, specialty, and 4-year colleges with a 50-mile radius of the town. With McDowell Sonoran Preserve and McDowell Mountain Regional Park bordering Fountain Hills, there’s hundreds of miles of hiking and biking trails. Fountain Hills has an off-leash dog park and lots of designated areas for organized or pick-up sports games. Residents enjoy the community’s multi-day art festivals, the well-organized 4th of July celebration, and simply living in a town with a grand and world-renowned fountain. Nestled in the midst of protected Indian land, Fountain Hills is an upscale community that offers organized cultural events and festivals, along with top-notch schools, easy access to biking and hiking trails, great restaurants, and lot of fabulous shopping. Top that with its pristine golf courses and the town’s own world-renowned Fountain, and you’ve got a place to call home that many others can only dream of.